Its a pleasure to review this latest CD by Lydie Auvray accompanied by her trusted Auvrettes and with the participation of the Indigo string quartet. 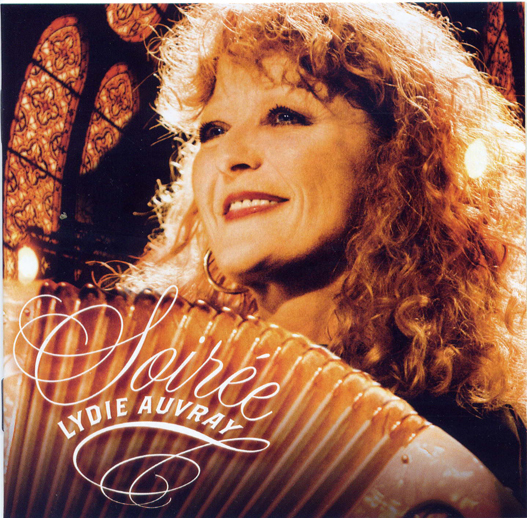 A career spanning 30 years for her and 25 for her group are condensed in this collection entitled  Soiree, which is also available in a DVD version. This Cd was recorded entirely live at the Kulturkirche  in Koln on the 3rd November 2007. Soiree showcases the talents of the accordionist at her very best. Its worth noting the ability of Auvray to give something extra to every new release, to give a deeper richer meaning to her way of making music. 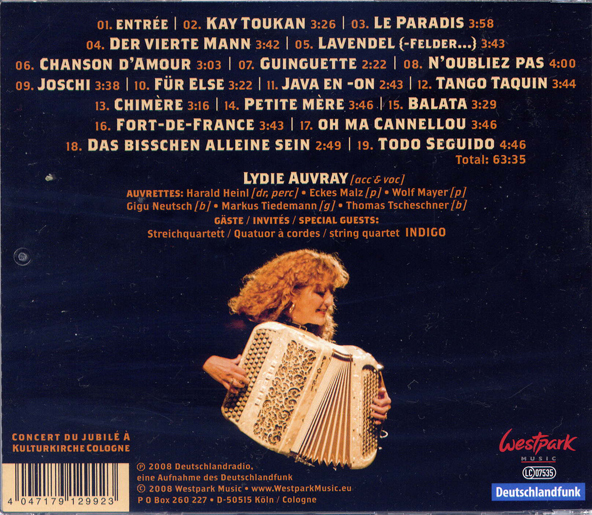 Lydie Auvray succeeds here by celebrating her double anniversary with a live recording. With 18 tracks, the artist highlights her musical career perfectly and provides a Cd that will be appreciated by both by fans and those who are new to her music. Indeed if we only had to buy one of her recordings this would be it. The artist write that she hopes to have given , in  Soiree, an idea of the collaboration she has had with the group over time and we can only confirm that she has succeeded in her aim. Lydie Auvray shows us, if proof were necessary, that she is able to provide music which is always pleasing and never dull; an expressive performer with a curious way of doing things, open and faithful towards the outside world and with a hint of irony and awareness, perhaps a little melancholic, that show in the look on her face, splendidly captured by the cover photograph.